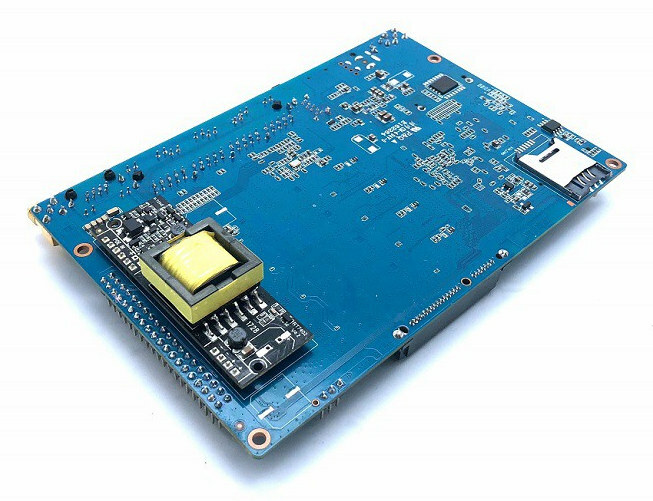 SinoVoIP launched several Banana Pi router boards in the past starting with Allwinner A20 based Banana Pi BPI-R1 in 2014, and followed by Banana Pi BPI-R2 board powered by a Mediatek MT7623 processor last year. Such boards normally include multiple Gigabit Ethernet ports, as well as at least one SATA connector, and in some cases an mPCIe connector for WiFi or LTE cards. THe company also launched Banana Pi BPI-W2 board a few months ago, but that model is more geared towards multimedia router use cases. 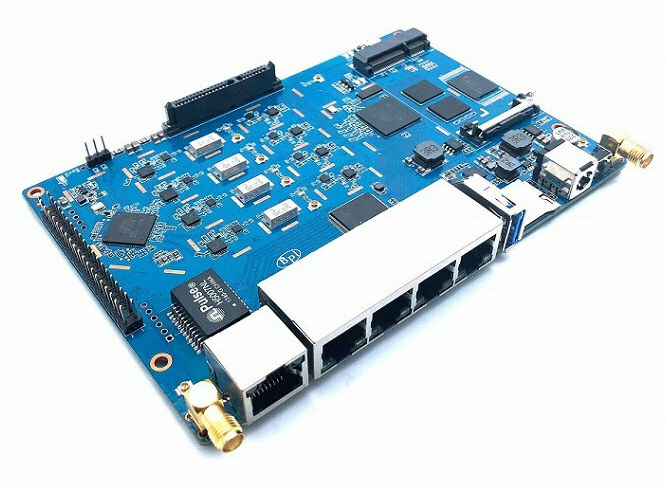 The company has now unveiled Banana Pi BPI-R64 router board based on Mediatek MT7622 dual core Arm Cortex-A53 processor, five Gigabit Ethernet port, on-board 802.11ac WiFi, one “laptop” SATA port, as well as an optional PoE (Power-over-Ethernet) add-on board. 802.11n built in SoC (If the board is based on MT7622A the Bluetooth 5 is also present, if not that’s MT7622B). The board will support OpenWrt, Android, and Linux according to the company, but I really doubt Android gets ported to that router processor. The Wiki is up, but clearly under construction, especially when it comes to software support. SinoVoIP has a history of announcing hardware many months before launch, so I’d expect Banana Pi BPI-R64 to become available around Q1 2019. Interesting concept from BPi again … will wait till a decent kernel, u-boot is ready..
Fellows, is there any use cases for this board? If we thinking about router, I would prefer mikrotik devices. Maybe the board will be good NAS? Ok. Is there any other boards, that can utilize Gigabit Ethernet and SATA/NVMe speeds? > any other boards, that can utilize Gigabit Ethernet and SATA/NVMe speeds? Gigabit Ethernet is no problem with many recent ARM boards (not talking about RPi 3 B+ of course) but what should ‘SATA/NVMe speeds’ mean? SATA on their first ‘routerboard’ was slow as hell since Allwinner’s A20 SoC contained SATA more or less by accident. I’ve never seen real storage benchmarks for their R2 and I doubt this will change with the R64 now. Marvell Armada SoCs all have very fast SATA implementations and wrt NVMe/PCIe speeds it always depends. PCIe here is 2.0 (so Gen2 link speeds max) and since one lane is already occupied by the Wi-Fi chip there’s just one lane left (compared to what fast NVMe SSDs want — Gen3 x4 — Gen 1 x1 is just 1/8 of the theoretical bandwidth). With Rockchip’s RK3399 SoC we get with Gen2 link speed and 4 lanes up to 1600 MB/s (web search for “Some storage benchmarks on SBCs” provides more numbers).